Lo and behold, that "mini" craze has caught up with manufacturers indeed, and it's almost a given now that once a flagship is launched, a miniaturized version of it, riding on the coattails of the larger sibling's name recognition, will appear in a month or two. HTC is no exception now, and we are pitting the just-announced One mini 2 against last year's One mini, and throwing in the current Samsung S4 "mini" warrior for a good measure, despite that the S5 mini is probably just around the corner, too. What you can clearly see from the first glimpse at the comparison table below, is that we are dealing with the Snapdragon 400 crowd here. This midrange processor has proven capable to run Android without major hiccups, but might be a bit long in the tooth for, say, the latest 3D games. That's all right, as if you are eyeing a 4.3" or 4.5" handset you probably aren't into the blazing graphics of Asphalt 8 too much anyway. Out of the three, only the S4 mini sports a gig and a half of RAM, whereas the HTC handsets make do with 1 GB, but since we have Android 4.4 KitKat on the phones, the RAM point is somewhat moot. The biggest upgrades from the One mini to the mini 2 for us are the camera, and the presence of a microSD slot. The 4 MP UltraPixel shooter in the One mini isn't anything spectacular, as it doesn't sport the OIS tech of the larger HTC One, but the 13 MP unit in the One mini 2 is likely the same Sony sensor that has proven itself in most aspiring mid- to high-enders these days already. Add to these niceties the BoomSound stereo speakers, 5 MP wide-angle front camera, plus the largest battery of the bunch, and the One mini 2 suddenly becomes a very, very appealing handset. It has the biggest screen in the trio, and a premium aluminum unibody design, too, so the only way HTC can't fight any "mini" thrown its way, is if the price of the mini 2 is uncompetitive. 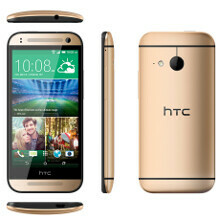 best mini with almost high range spc.. great job htc.. like it. God job HTC. Best mini version available.